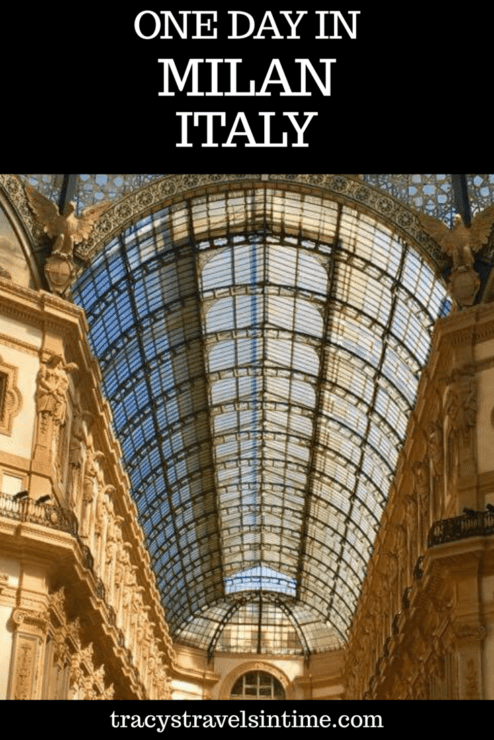 One day in Milan - an itinerary to make the most of your visit! 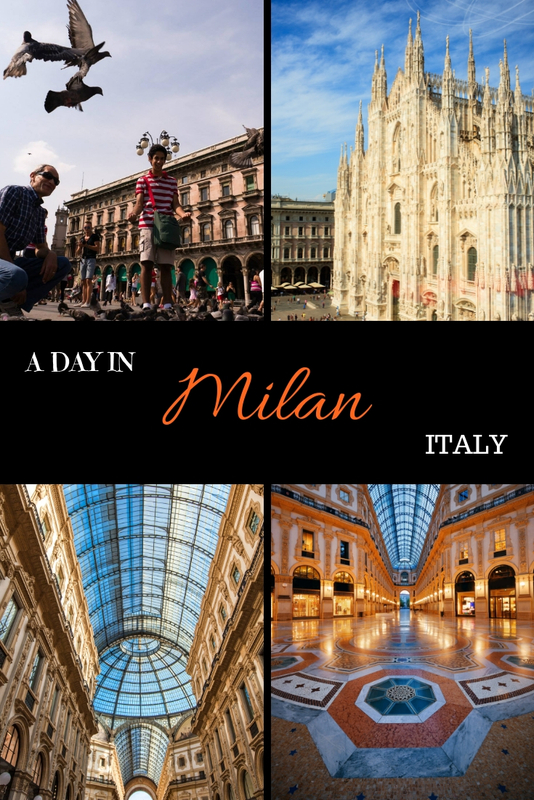 One day in Milan – an itinerary to make the most of your visit! If you only have one day in Milan you may be wondering exactly what you can see in this short period of time. Although I had been to Italy on many occasions we had only changed trains in Milan and continued on our journey without seeing anything of the city. On a recent train tour of Italy we found that we had one full day in the city after arriving from Venice and prior to continuing onto Switzerland via the Bernina Express. It gave us some time to explore the city and even though it was a pretty full day I was quite happy with what we were able to see and do. If your Milan itinerary only allows one day in Milan these are the top sights I would suggest adding into your plans. Start your day at the Piazza del Duomo! 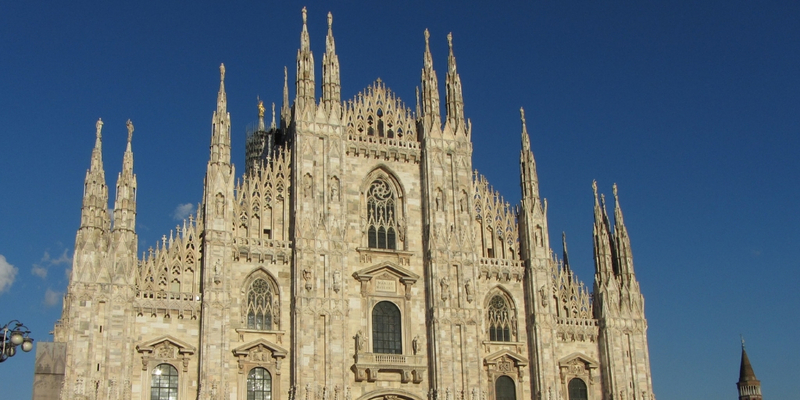 The Duomo in Milan is one of the world’s largest cathedrals. Construction was started in 1386. The cathedral was consecrated in 1418 building works continued for another 200 years. There are 52 pillars inside the cathedral to mark each week of the year and a sundial on the floor to help keep track of time. The marble floor is the original and very beautiful. Spot the signs of the zodiac as you walk along. There are also 3,400 statues that adorn the cathedral including the famous Statue of St Bartholomew flayed. You will be searched when entering – no liquids are allowed into the cathedral. The queues will be very long in summer so I would highly recommend that you purchase a ticket to skip the line! 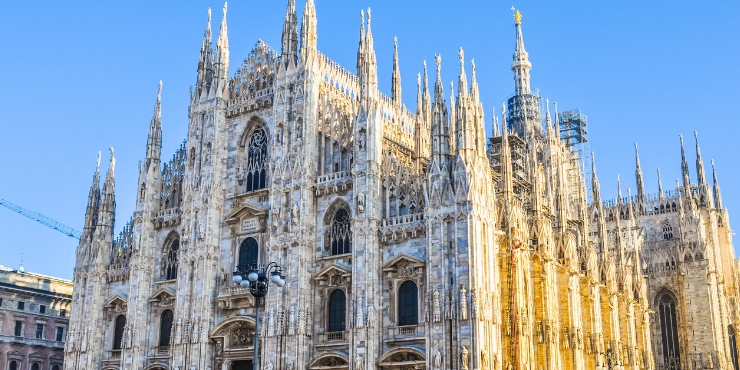 Enjoy a 1.5-hour tour of the Milan Cathedral complex, including the terraces and the archaeological area beneath the cathedral. Discover the history of this famous monument with your expert guide. You’ll also have access to the Duomo Museum and San Gottardo Church. Skip the lines and enter the cathedral. Admire this stunning example of Gothic architecture, and the artworks that decorate its interior. Continue to the rooftop terraces by elevator, for breathtaking views over the city. Then explore the archaeological area beneath the Duomo, where the ruins of the Baptistery of San Giovanni alle Fonti were found. After your guided tour, you can visit the Duomo Museum and San Gottardo Church on your own. 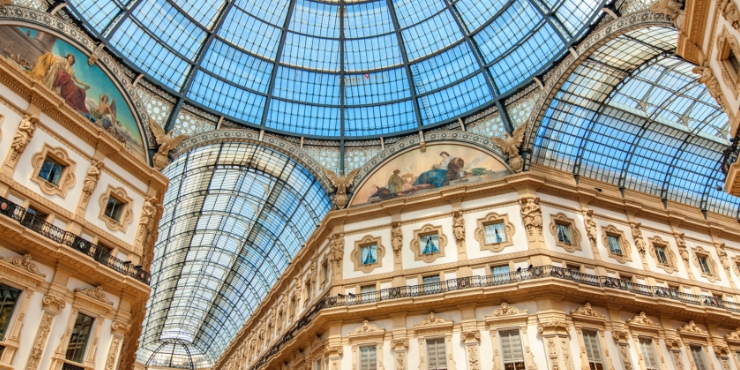 A short 3 minutes walk from the Duomo you will find the Galleria Vittorio Emanuele 11. What can I say? It is a shopping mall but like no other I have ever seen. and is truly stunning. The centre opened in 1877 and really is worth a visit though I wasn’t sure if anyone actually does any shopping in it or if it is just full of tourists taking photographs all the time! It is really lovely and the forerunner of all our present day shopping malls and ‘gallerias’. I f you want to take a photo of the famous (and very beautiful) tiled floor you need to get up early in the morning before the tours arrive. 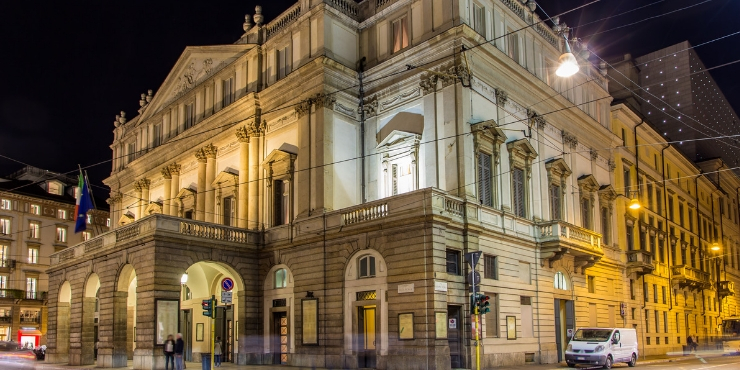 La Scala Opera House in Milan is one of those iconic buildings with which we are all familiar (opera fans or not) and it is worth visiting as it is only a few minutes walk from the Galleria. The building may not be too impressive from the outside but once you are inside you will find it is very beautiful. La Scala is situated in the Piazza della Scala a few minutes walk from the Galleria. Make sure you don’t miss the statue of Leonardo Da Vinci which stands in the centre of this square. The theatre opened in 1778 and has been renovated a number of times since it opened. During WW2 it suffered significant damage. Da Vinci’s mural “The Last Supper” is painted on one wall of the refractory attached to the church of Santa Maria delle Grazie. The mural was painted by Da Vinci between 1495–1498. The mural has been restored numerous times over the years and narrowly escaped destruction when it was bombed during the second World War. If you want to see what is arguably one of the greatest pieces of art in the world I would recommend that you book ahead of your arrival in the city. Tickets can be purchased up to 3 months in advance on the official website but they can sell out quickly particularly during the busy summer months. If you are unable to book tickets through the official website I would suggest booking a third-party tour. This is what we did and we found it a great way to ensure we could see the painting on the date we were in Milan. Visitor numbers to view the painting are limited to only 25 people at a time. There is one entrance in and another out and you pass through a humidity controlled chamber before entering. Once in the room you have 15 minutes to enjoy the painting. There are many websites posing as the official site for the Last Supper – this is a link to the official website. If you aren’t able to book tickets for the day you want I would suggest booking a tour. Your guide will take you inside the old Refectory of an ancient Monastery where you can admire the Last Supper painting. Spend 15 minutes in front of the painting and learn all about the incredible history behind it. Most of the sights are within walking distance of each other. 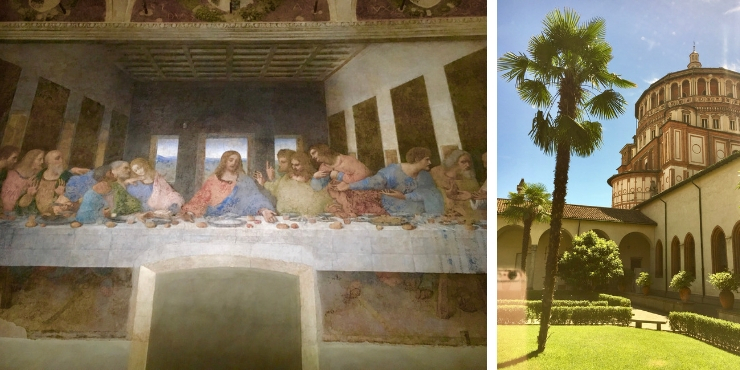 If you haven’t booked a tour to The Last Supper and have to travel to Santa Maria Delle Grazie independently I would recommend taking the Metro or calling an Uber. We visited Milan in August which is the busiest time of year. If you are visiting during the height of the tourist season book tours, hotels and tickets in advance or you may find it difficult once in Milan. Wear comfortable shoes as you will be walking a lot! Stay near to a metro station as this is the the easiest way to get around the city. Beware of pickpockets and scams when you are on trains or in busy areas. I recommend using an anti-pickpocket bag to protect your belongings. I never travel in Europe without one as pickpockets are unfortunately all too common. Was fascinated by the sculpture of St Bartholomew. Such detail with the muscles and bones and with the skin drooping down. Many people passed this by but we 4 were mesmerised by it. Hi Jill…I know what you mean! We spent quite a long time inspecting this sculpture…I was sure I had taken some photographs but alas not! Next time! That shopping mall is always enough to make me want to go back to Milan, it’s so beautiful, even if I can’t afford to shop there! Can you still go on the roof of the duomo do you know? That was the highlight for me I think. Hi yes I think you can but we didn’t – I am not great with confined spaces and have a total panic if the stairs aren’t very wide! Hi yes I skipped the shopping totally! For me the highlight was the Last Supper (I am not religious at all I just loved the painting) but The Duomo is also pretty spectacular! Love it!!! ? And you put all my top favorite places! So many people skip the last supper is a must! Milan was such a great time when I went. I spent forever at the Duomo. So beautiful and the views from the top were just breath taking. Such a nice city. It really is gorgeous. Didn’t make it to the top of the Duomo unfortunately (stairs and confined spaces aren’t my favourite things! )but I can imagine the view was lovely! Yes it is definitely worth a visit as there are some lovely things to see. You know, sometimes I’m tempted to skip the big touristy sights in some places because I can’t be bothered with all the hassle, but after reading this I definitely wouldn’t skip out on The Last Supper. What a spectacular piece of art, no wonder it’s so iconic. Definitely do!!! I had such a reaction to it…was just breathtakingly beautiful. My boyfriend is headed to Milan in a few weeks time for work. Guess I need to share this with him now 🙂 Thanks for linking up with us! nice to meet you! I have been following your blog for a while – just love Norway! I hope your boyfriend enjoys Milan! Wow! I went to Milan once but I am not sure if I can call it a proper visit. I was on an organized tour and you know how rushed things feel sometimes. This is a city I want to visit again in the future. We were only there a short time but really enjoyed it. Worth a second visit! It is definitely worth seeing!